Leeks are wonderful for adding a delicate onion-like flavor to dishes of all sorts. They are particularly popular for using in soups and stews where, if you fail to get them clean, the dirt that can hide between a leek's layers can make the whole pot a tad gritty. Luckily, there are easy ways to clean leeks. 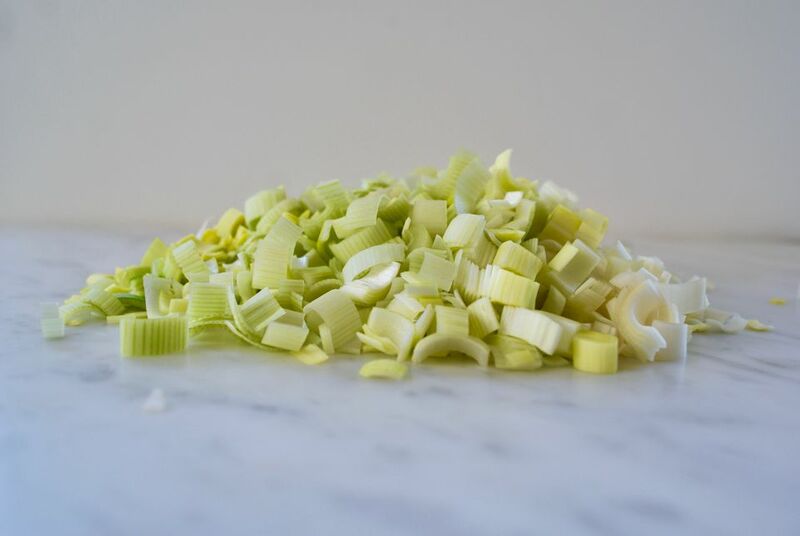 One choice is, of course, to simply chop or slice the leek as you like, put the leek pieces in a large bowl of water, swish them around to loosen any grit and dirt, and lift the pieces of leek out of the water. The problem with that method is two-fold: first, you need to fish the leek pieces out of water (and no, you can't just dump them all into a sieve - the dirty water poured all over them in the process will redeposit the dirt! ); second, if the leeks are quite dirty, the cutting surface will need a good scrubbing, too. Easier, faster, and cleaner is this method. It starts by cutting off and discarding the root end of the leek. Trim off as little of the leek white as possible; it's the part called for in most recipes. Cut the white and bottom 3/4 of light green part of leek lengthwise, leaving the top of the light green section and the dark green leaves intact. You want the layers of leek to be able to fan out but remain attached. Turn the leek a quarter turn and cut it lengthwise again (as in Step 2) so the leek is cut into quarters lengthwise. Using the dark green leaves as a handle, rinse the cut white and light green section of the leek under cool running water, fanning them apart to remove all dirt and grit as needed. If the leeks you're dealing with is particularly dirty, you may want to rinse off the dark green "handle" first, just to get rid of any big clumps and keep them from migrating over to the lighter part you'll be cutting to use. 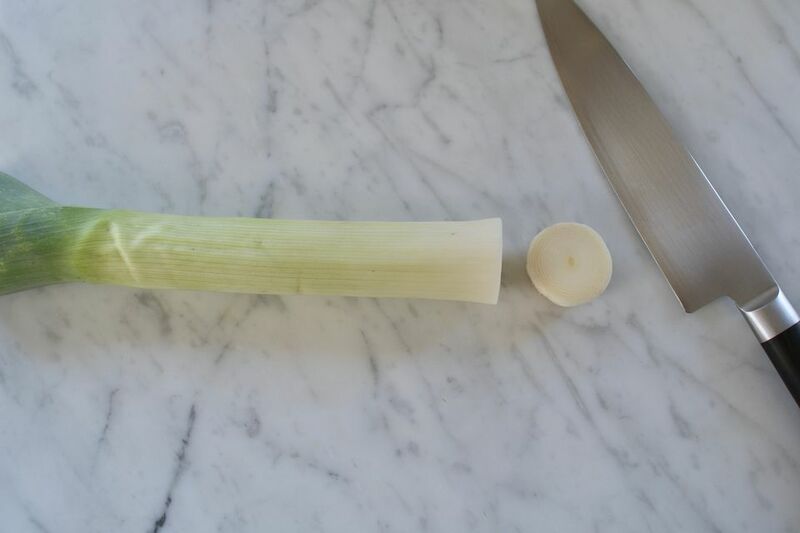 Cut leek to desired shape and size. How you cut them really depends on how you're going to use them. For using in soups that end up pureed, like Potato Leek Soup, a really rough chop is fine. You can cut them into much larger pieces than pictured above. For dishes where the pieces of leek show up in the dish like Green Garlic and Leek Risotto, make sure to chop the leek finely and evenly much as pictured above. For dishes where there are a lot of leeks, such as Leek Tart or Potato Leek Gratin, make sure to slice them thinly or mince them so their often fibrous texture doesn't get in the way—even smaller than pictured wouldn't be the worst idea. Note: There is no need to toss the darker green part of the leek. Save them to flavor stocks or know that if chopped up and slowly cooked, they get just as tender as the rest of the leek!